Cut the jalapenos in half and remove all of the seeds. Combine the cream cheese, salsa verde and shredded cheddar in a small bowl. Once combined, add to a pastry bag or a sturdy 1 quart ziplock bag and cut off one corner so you can squeeze the cheese out of the hole and into the peppers. Fill the peppers with cheese mixture. Meanwhile, cook the bacon in the microwave or saute pan for a few minutes until it’s starting to brown a little but is still soft and pliable. Cool and then wrap each jalapeno half in one piece of bacon. Secure with a toothpick. Place on a foil lined cookie sheet (with sides) and bake in a preheated 375 degree oven for 15 minutes. Set the oven to broil and cook for 2-3 minutes, watching carefully to make sure they don’t burn! This gives the peppers a nice roasty flavor and ensures that your bacon will be crisp. 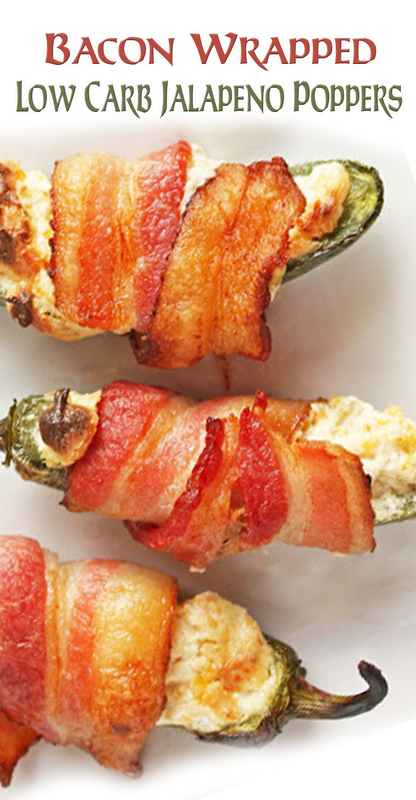 Remove the jalapeno poppers from the oven and cool slightly before eating. Super low carb and soooo delicious!